Abbreviated to Lp(a) and pronounced ‘L’ ‘P’ little ‘A’. You may have heard of a ‘bad’ cholesterol called LDL. Lp(a) is another type of ‘bad’ cholesterol. Like high levels of LDL, high levels of Lp(a) can stick in your artery wall (called atherosclerosis), slowly blocking the artery. Blocked arteries can lead to heart attack, stroke and other circulation problems. These are called cardiovascular diseases. A person with elevated Lp(a) is 2-4 times more likely to have these problems when compared to a person with lower Lp(a) levels. Elevated Lp(a) is a genetic (inherited) condition. If you have elevated Lp(a) there is a 1 in 2 chance that your brothers, sisters and children will also have elevated Lp(a). The parent you inherited it from will also have elevated Lp(a). As the level of Lp(a) is genetically determined it is usually not lowered by lifestyle changes e.g. diet and exercise. 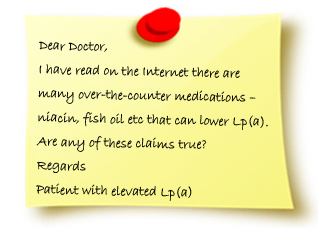 There are currently no medications that will reduce Lp(a) significantly. Your level of Lp(a) remains virtually constant throughout your life. It is believed that 1 in 5 people has elevated Lp(a), but most don’t know they have it. One of your close family members has been diagnosed with elevated Lp(a). You have premature cardiovascular disease (heart attack, stroke, angina, stent, CABG) and have normal or only mildly elevated cholesterol levels. Premature is defined as men below the age of 55 and women below the age of 60. You have high cholesterol levels that do not respond to standard treatments. You have Familial Hypercholesterolaemia (FH), an inherited elevated cholesterol condition. 1 in 3 people with FH also has elevated Lp(a). How is elevated Lp(a) treated? The level of Lp(a) is genetically determined and is usually not lowered by lifestyle changes, although diet and exercise are very important in reducing your overall cardiovascular risk (see later). There are currently no medications that will reduce Lp(a) levels significantly, although there are several promising new treatments currently being trialled. Lipoprotein apheresis, a procedure similar to renal dialysis is used in severe cases to lower Lp(a). Management of elevated Lp(a) focuses on aggressively reducing your overall cardiovascular risk – the chance of having a heart attack, stroke or other cardiovascular disease. If you have all or many of these factors then you have a HIGH cardiovascular risk. That is, you have a HIGHER chance of having a heart attack, stroke or other cardiovascular disease. Even though you cannot reduce your Lp(a), if you improve all or many of the other factors then you will LOWER your cardiovascular risk. That is, you will LOWER your chance of having a heart attack, stroke or other cardiovascular disease. Take your medication as prescribed by your doctor to reduce your LDL, glucose and blood pressure. If you smoke cigarettes, help in quitting. Smoking speeds up the rate that LDL and Lp(a) stick in your arteries. Stopping smoking is the single most important thing YOU can do to reduce your cardiovascular risk. Also, avoid second-hand smoke. Tell your family members that you have elevated Lp(a) and encourage them to be tested. Join the National FH Registry, which has a section for people with elevated Lp(a). The registry is a database of patient information which will be used to further the understanding of Lp(a) and ultimately improve patient care. By joining the National FH Registry you will have access to the latest information and trials for new Lp(a) treatments. Niacin can lower Lp(a) in some patients by up to 30 percent. However, niacin can have serious side effects, so should only be taken with the supervision of a doctor. LDL has been identified as the most important cardiovascular risk factor to reduce. Latest trials have shown if you are taking a statin to reduce your LDL, then adding niacin is of no additional benefit. Co-enzyme Q10 and fish oil have been suggested as beneficial but have not been proved in clinical trials.